No one is going to be better able to speak to this Lao Tzu quote than Mr. Chris Parsons. 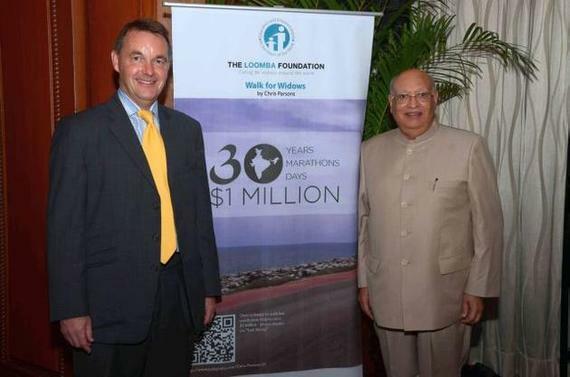 On January 10, 2015, the 53- year-old British attorney will be walking across India to benefit The Loomba Foundation. For the past several months he has adhered to a rigorous training schedule to prepare for this monumental journey. In 2011, Mr. Parsons was attending an event in London, and happened to be seated next to Lord Loomba, CBE. It was at this event that Lord Loomba talked to Mr. Parsons about the impetus for the Loomba Foundation. When Lord Loomba, was a young child, his mother was widowed with seven children. As a result of this tragedy, Lord Loomba created the foundation to provide economic, educational and social empowerment to widows and their children. Before meeting Lord Loomba, Mr. Parsons had already decided that he wanted to bicycle 2000 km from London to Gibraltar to benefit a charity to mark his 50th birthday. After talking with Lord Loomba, about his foundation, Mr. Parsons chose to support the Loomba Foundation through his cycling expedition. Mr. Chris Parsons with Lord Loomba, CBE. Photograph belongs to The Loomba Foundation and is used with their permission. This time Mr. Parsons will be walking from Mumbai to Bangalore. The 1260 km distance divided into thirty days means that Mr. Parsons is walking the equivalent of a marathon (42 KM) a day. The course isn’t flat, and the high temperatures add additional challenges. Each day, he will walk anywhere from eight to twelve hours. “The reality is that I fully appreciate how tough it will be,” he notes. He is counting on locals to walk beside him, which will provide the critical emotional support often needed for such a challenging task. “I’m stepping into the unknown,” Mr. Parsons adds. However, he will not be embarking on this alone. He has a support team in a follow car, complete with a physiotherapist who will have a full medical kit to aid with any walking related ailments. His sponsors include Apollo Hospitals, Gatorade/Pepsi, TCS and the Bombay Stock Exchange. It is not a coincidence that Mr. Parsons decided to pursue this walk within thirty days. He chose the number thirty to honor his own 30 year work anniversary with Herbert Smith Freehills, an international law firm. As part of his work, Mr. Parsons travels to India from London each month. When in India, he advises on foreign law (mainly English and United States), and teaches English law at a number of the Indian law school, often in conjunction with Oxford University. To learn about the Loomba Foundation, please check here theloombafoundation.org/.